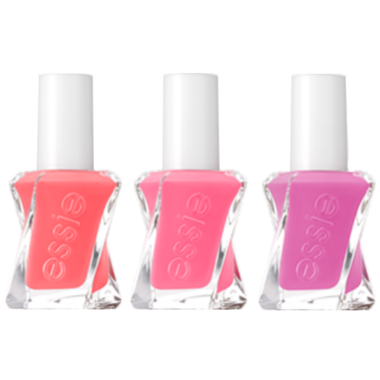 These Essie Gel Couture Nail Colours are part of an extravagantly sophisticated collection. Crafted to perfection and fashioned to last. Designed with the haute vision of couture, with the staying power that introduces luxury to your fingertips. How to Apply: Apply 2 coats of gel couture colour to clean, bare nails. Allow to dry. Then finish with 1 coat of Gel Couture Top Coat. This is suuuch a good gel polish, withiut curing!! I use it weekly (since I normally change my nail color quick). But it does last! Even with the many times I wash my hands, dishes, etc it still lasts. The only chip tends to happen at the tip of the nail. I LOVE this product!! It really does last 2 weeks and only the tip chips off. It tries faster than normal nail polices and has a very nice shine! I woukd suggest this to anyone who loves to do their nails but hates that it can chip and crack in a few days. LOVE LOVE LOVE the rounded, flat brush, which lets you apply colour in one stroke while getting really close to the nail bed/cuticle. Don't love the staying power, which is not nearly as long as claimed. Longest lasting non-LED nail polish! I prepped my nails, applied colour, followed by the Essie top coat from this line, and I am 6+ days chip free! Will be purchasing more colours. This is the best non-curing nail polish I've ever used. I have a LED light and an assortment of Gel polishes at home and prefer this line. It doesn't need a light, doesn't need a basecoat and you can use any topcoat (I use one by ORLY). I wore this for 9 days with no chips and I'm really hard on my hands. I won't buy another drugstore brand nail polish. This product gets high marks for lasting longer before chipping. Colour assortment could be widened. These new bottles are AMAZING and infinitely improved from the regular Essie bottles! The brush is wide and round, requiring fewer brush strokes. It also lasts much longer without chipping. I'm in love! Never buying a regular bottle of Essie again. good bottle and brush design. thought this was supposed to come with the step 2 top coat though.